This article by Giacomo Lee was originally published in issue #5 of print magazine Infinity, as released in October 2017. In the latest Doctor Who finale, The Doctor Falls, we saw our titular Time Lord tied to a chair, explaining to his captors about a theory he holds that Cybermen are an inevitable part of intergalactic evolution. Amongst the planets he named where people eventually unleashed the Cyber peril upon themselves were a few of the more familiar names, such as Earth and Mondas, along with a reference that would have gone straight over the head of many viewers sitting at home, glued to their own chairs - Marinus. Any Grant Morrison fans who also watch the show may have got the reference, though, Marinus being the location of his Cyberman tale The World Shapers, a comic strip released in a 1987 edition of Doctor Who Magazine, back when Morrison was yet to break it big with his trademark ‘meta’ take on heroes in capes and cowls. Marinus on the TV show had been location to a species called the Voord, as encountered by the First Doctor; by the time the Sixth Doctor arrived there in the comics, the Voord had begun to upgrade themselves into Cyberman form. Despite having a history as long as the show, this is one of the very few times the revival of Doctor Who has given nod to the comics, thus making them canon. With so much history and so many stories told in the Doctor Who universe, though, the greatest danger isn’t forgetting what’s in continuity and what isn’t, but how easy it could be to lose hold of all the great material and charming idiosyncrasies from the comic side of the franchise. And that’s where Vworp Vworp! comes in. A fanzine that was first unleashed on the world in 2010, Vworp Vworp! stands out from other Whovian projects in the printed realm in how it solely covers the world of Doctor Who comics, with a special emphasis on material published before the revival. Coming in at two hundred pages with over three covers to choose from, the latest volume also comes with a free audio tale called The Mechanical Planet, a specially produced adaptation of a Dalek comic written by Dalek creator himself, Terry Nation. This willingness to push out the boat for fans in both content and bonus ephemera struck me as a reader, and I didn’t hesitate to reach out to the zine’s creators, Colin Brockhurst and Gareth Kavanagh, to find out more on this humbling project of work. The main impetus behind Vworp Vworp! seems to be to ensure such a rich history behind Doctor Who is never forgotten, regardless of whether its canon or not. Would you say that was the main reason behind starting the zine? Colin: It was Gareth who had already come up with the idea of Vworp Vworp!, some time before I was brought on board. It was originally to have been a book, which evolved into a magazine. Soon after Gareth was looking for a designer and, having worked with me on promotional material for the pub in Manchester he was running at the time, he asked me. 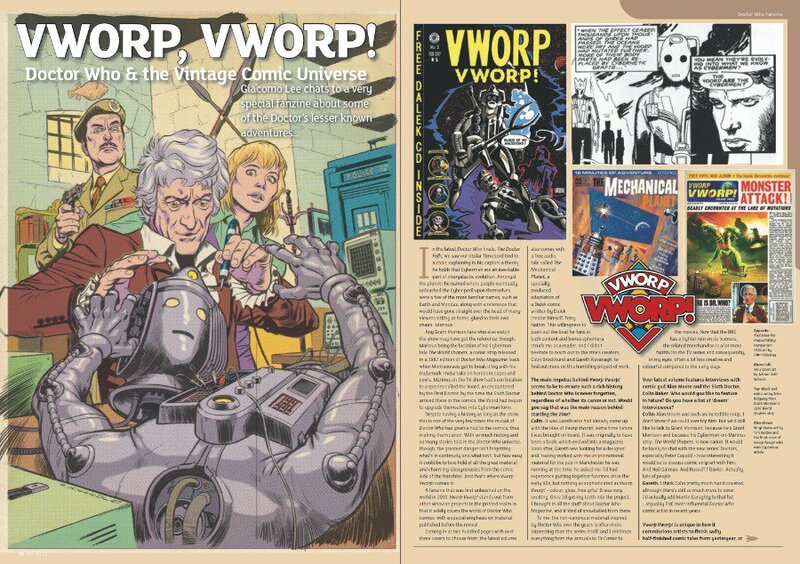 I’d had experience putting together fanzines since the early 90s, but nothing as sophisticated as Vworp Vworp! - colour, gloss, free gifts! It was very exciting. Once I’d got my teeth into the project, I brought in all the stuff about Doctor Who Magazine, and it kind of snowballed from there. To me, the non-canonical material inspired by Doctor Who over the years is often more interesting than the series itself, and I celebrate everything from the annuals to TV Comic to the movies. Now that the BBC has a tighter rein on its licenses, the related merchandise is a lot more faithful to the TV series and consequently, in my eyes, often a lot less creative and colourful compared to the early days. Your latest volume features interviews with comic god Alan Moore and the Sixth Doctor, Colin Baker. Who would you like to feature in future? Do you have a list of ‘dream’ interviewees? C: Alan Moore was such an incredible coup, I don’t know if we could ever top him. But we’d still like to talk to Grant Morrison, because he’s Grant Morrison and because his Cybermen-on-Marinus strip The World Shapers is now canon. It would be lovely to chat with the new series’ Doctors, especially Peter Capaldi - how interesting it would be to discuss comic strip art with him. And Neil Gaiman. And Russell T Davies. Actually, lots of people. Vworp Vworp! is unique in how it commissions artists to finish sadly half-finished comic tales from yesteryear, or follow up on forgotten characters specially created for the classic strips, e.g. Robot Agent 2K. Are there other examples of these you’d like to do in future, or any other comic stories you’d like to re-introduce to a modern audience, as you’ve done with The Mechanical Planet? C: There are actually, most of which I think we’d like to keep under our hats for now. 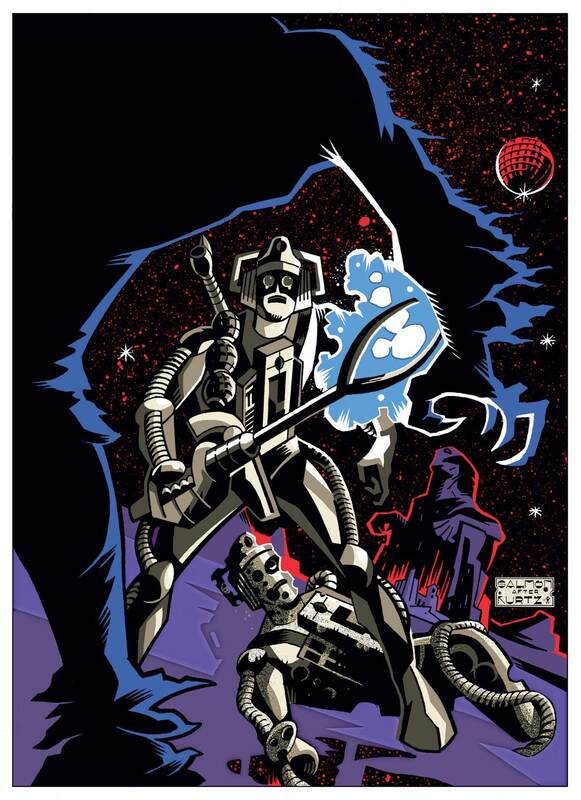 One day, maybe, we’ll finish Iron Empire, the sequel to (Fourth Doctor strip) The Iron Legion which Lance Parkin wrote for us that didn’t get beyond a script and a couple of pages of cracking artwork. G: Iron Empire for definite, such a great story. I love how VV! not only talks about the comics, but also printed ephemera such as story cards given away with sweet cigarettes back in the 60s. Are there any obscure parts of the Doctor Who franchise you’d like to tackle next? C: I’d like to leap into the crazy world of the annuals and get a feel of what it was like to work for World Distributors from artists like Paul Crompton. 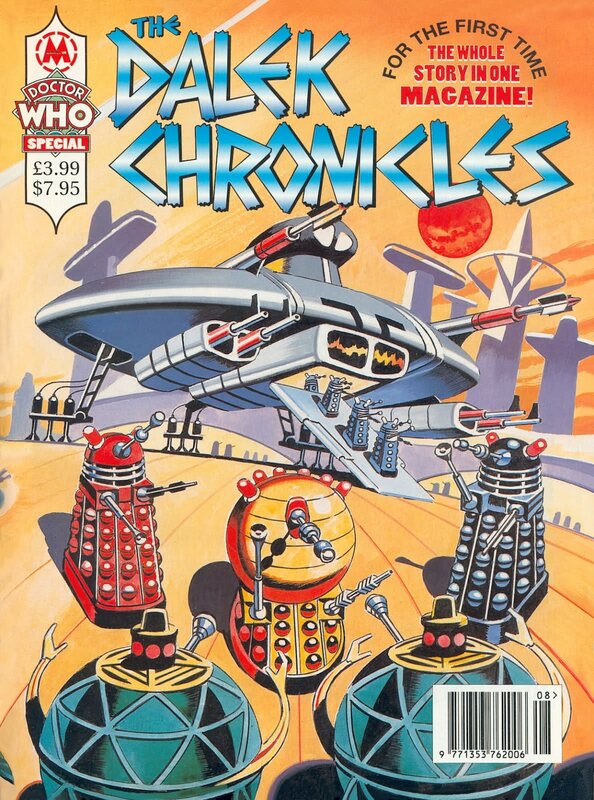 And I think we’ve barely scratched the surface of Doctor Who Magazine’s comic strip - all 38 years’ worth of it! G: There’s definitely something to explore in some of the wildly inappropriate merchandise from over the years and the art behind them! Even if it was just a whisper or proposal, I think imagining these ‘what if’ pieces is an area in which Colin and Vworp really excels. C: Haha, we’ll have to talk about that one! Gareth and I have yet to agree on what falls within Vworp Vworp!’s scope. For me it’s the art and design of Doctor Who, plus Doctor Who comics and magazines. G: Keeps it interesting though! Always plenty to explore, within reason of course. And then, of course there’s always the increasingly bonkers free gifts we produce, upping the ante every time. C: For me, the exuberance of the 60s comic strips, most of which played fast and loose with Doctor Who as we know it but remained wildly entertaining - often, admittedly, for the wrong reasons. And I think there’s pleasure to be had in all eras. Some I don’t often revisit but there’s always enjoyment to be found when I do. G: For me, it’s unquestionably the post-’79 Tom Baker strips. A portrayal of Doctor Who as bold, bright and confident which must have had an influence on the last 10 seasons of the show. The backup strips are also wonderful. Dark, grim, nihilistic little slices of death where the universe has to get by without the mad man and his box. Moving forward, the Eighth Doctor run is another game changer for the strip, with Scott Gray and Martin Geraghty confidently reshaping Doctor Who at a time when it would have been all too easy to just look back nostalgically. As for those that are less successful, the early Sylvester McCoy stuff is a little dumbed down, sadly although it’s still not without merit. Which, to be fair goes for every era of Doctor Who in every medium! Which classic foes do you think have had interesting portrayals in the comics, showing them in a different light to the TV show? G: Without doubt, this is a real strength of the backup strips. The monsters get their day in the sun! The Black Legacy Cybermen are particularly memorable, as is the friendly Kroton from Soul of a Cyberman. I love the way Steve and Alan Moore are able to consider a single aspect of, say, the Cybermen and spin it off into a satisfying and thought-provoking story. The same goes for Adrian Salmon and Alan Barnes’ The Cybermen strip from the 1990s, which is bold and bonkers. It’s funny how the Cybermen have become the bellwether for change and innovation in the strip! Of course, all of these innovations surely have their roots in the TV 21 Dalek strip, which is almost a Dalek I, Claudius. As far as they are concerned, it’s their story, they are the good guys! Which characters or tales from the comic would you like to see either on the show or revisited in the current comics? C: I’d like to see the REAL Emperor of the Daleks - I find it quite bizarre that such an iconic design as the Golden Emperor hasn’t made it onto the screen (I’m not counting Remembrance). Editor’s note: a Golden Emperor-lookalike called the Imperial Emperor featured in TV arc Remembrance of the Daleks. G: You’re spot on with the Emperor Dalek, Colin. It’s a curious miss that one. Alpha and his Humanised Daleks from Children of the Revolution would be wonderful. Same goes for (Cyberman companion) Kroton, especially if they can make him like Luke Cage as Ade Salmon always imagined! Oh, and the Voyager arc, but only as long as they can get Peter Jackson to reconsider directing. At last, the show can approach the heights of visual flair the strip has been delivering for nearly 40 years! C: I think Abslom Daak should be seen over Jodie Whittaker’s shoulder in a big Daleky battle scene, but off in the background because I don’t believe any actor could match the Daak conjured up in my head by Steve Moore and Steve Dillon. Finally, what’s been your proudest achievement to date with the magazine? G: I’m thrilled we managed to get Alan Moore to not only talk about Doctor Who but to engage so thoughtfully and energetically about his work and the contemporary series. It’s also a very sad fact that the Grim Reaper has taken his toll in recent years, so getting the chance to talk in detail with Steve Moore and Steve Dillon about their amazing Doctor Who work was all the more important and really justifies the decision we made back in 2009 to explore some of these lesser trodden paths. C: Probably finding something new to say about the TV Century 21 Dalek strip, and completing a further instalment in the story. And giving away an audio play starring David Graham as the Golden Emperor of the Daleks! I’m ridiculously proud of our third volume. And so they should be! Grab your own copy of Vworp Vworp! Volume 3 at www.vworpvworp.co.uk, where you can also read exclusive excerpts. Thank you to Gareth and Colin for talking to us, and I look forward to their next volume.